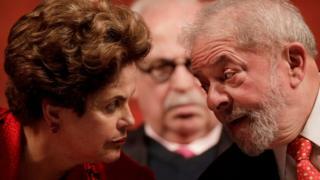 Brazil's top prosecutor has charged former presidents Luiz Inacio Lula da Silva and Dilma Rousseff with forming a criminal organisation to divert funds from the country's state oil company. Prosecutor Rodrigo Janot said Lula, Ms Rousseff and six fellow Workers' Party members committed a series of crimes involving Petrobras from 2002 to 2016. The ex-presidents deny the accusations. These are the first criminal charges against Ms Rousseff, who was impeached in 2016 for breaking budgetary laws. The charges are related to the sprawling Operation Car Wash that uncovered a scheme in which Brazil's biggest construction firms overcharged Petrobras for building contracts. Mr Janot said that Lula was the head of the alleged organization, and that the Workers' Party received some $480m (£370m) in bribes in several public entities, including Petrobras and the Brazilian National Development Bank (BNDES). The scheme allegedly started with Lula's victorious election campaign in 2002 and ended when Ms Rousseff was impeached last year, Mr Janot added in a 230-page document. Lula, who is still an extremely popular politician, is appealing against a corruption conviction that would bar him from running for president in 2018. He faces four other corruption trials. His lawyer said the accusation was baseless and that the law was being misused to persecute the former president. A representative for Ms Rousseff said the prosecutor's office had offered no evidence of the crimes and called on the Supreme Court to guarantee her right to defend herself against them.